The last month has been interesting because it recently dawned on me – I work too damn much. You’re like, “duh. DUH you work too much. You knew this already.” And – truth be told, I definitely knew I work too much. I have a full-time job, a part-time job that works me between 8-15 hours each week, and another part-time job that works me about two or three times a month at 6 hours per shift. I’m not sure how I’ve been doing some variance of this schedule since I was a freshman in college but…I am BEYOND over it. I’m a little fed up with not seeing my home for more than a few hours at a time (not including time I’m sleeping there…) and I’m tired of feeling like I neglect the people/animals who inhabit the house with me. Believe it or not however – it was actually incredibly hard to take my next step. After my trip to Iceland (which was this past May, mind you), I promised my sweet boyfriend that I would stop working so much and just deal with the lesser income in order to actually be at home. I would have more time to spend with him and the animals, organize our home, clean more, and just generally be less frantic. It took me 3 months to make that happen. 3 whole months of weighing, debating, and procrastinating about making the change. I worried about the money we would lose. How would afford small things like going out and buying silly luxury things like expensive nut butters or new running shoes? I waited and waited and waited. In those mere 3 months of waiting, it became apparent to me that I was beginning to morph into a person that weighed my fiscal success a little more than my spiritual and experiential success and it was beginning to wear on my body and mind. I was weary of leaving my loved ones at home while I worked. My intentions started out good and I still believe they are. I wanted to provide for my little home but I was beginning to lack in presence. I decided to quit my third job and no longer work Sundays at my second job. This will be the first month, in a long while, that I will have an actual dedicated day off to get my life together for the upcoming week and spend some much-needed quality time with the ones I love. My intentions for this month: breathe, be present, love, and do some freaking laundry! 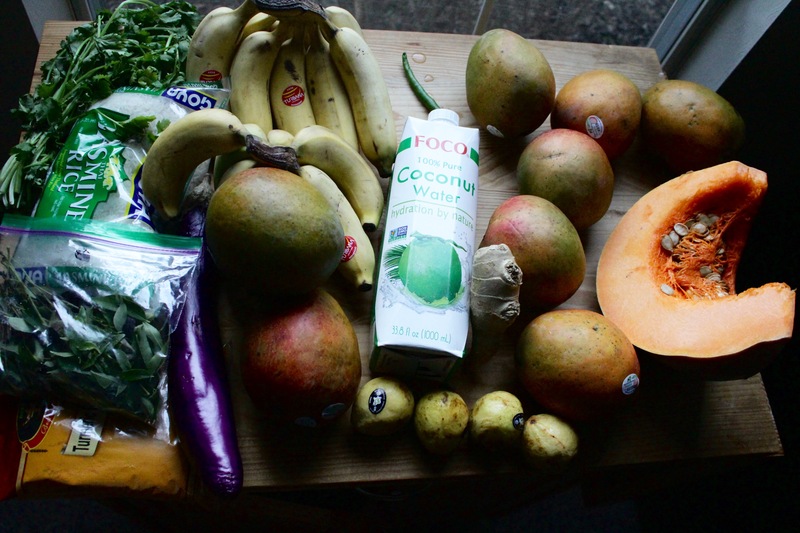 I got a whole bunch of cute, little bananas, cilantro, jasmine rice, fresh curry leaves, a bag of turmeric, a Chinese eggplant, 8 mangos, 1 liter of coconut water, 5 guavas (I ate one already), a hunk of ginger, a chili, and a wedge of pumpkin! Onto other news! 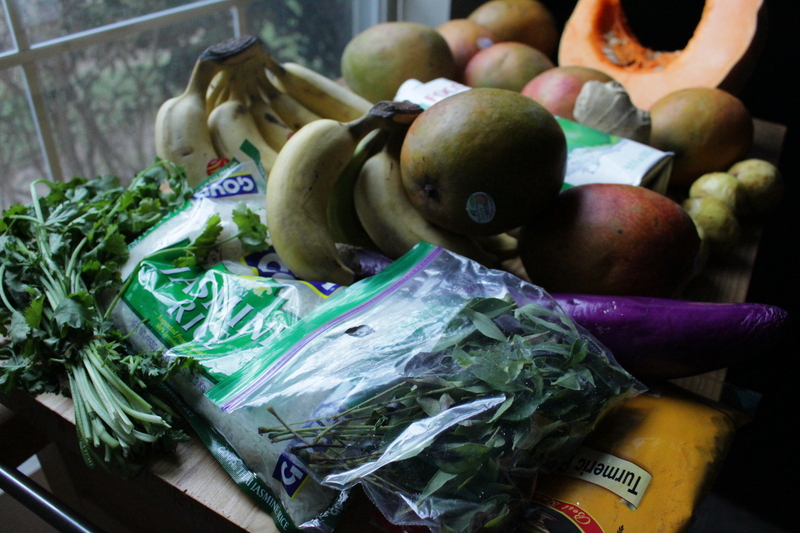 I recently stopped by one of my favorite Indian grocery stores and spent an exorbitant amount on fruit and vegetables. I’m not sure how they do it, but that grocery store has the BEST produce! It’s a small selection but it’s always exciting! If you’re in the area, you should definitely pay it a visit! I mainly went back to get a whole box of mangoes (I go through two a day almost) because their mangoes are the best I’ve ever had outside of the Philippines. I am a mango connoisseur. The leaves in the little baggie are fresh curry leaves! I have never used them before but I am ridiculously excited to give it a go! BUT! They also had cooking pumpkins, a selection of chilies, little baby bananas (so freaking cute! ), herbs and Chinese eggplants! Chinese eggplants are a skinnier, more purple version than the ones you normally see in the grocery store. They don’t taste too terribly different but I just grew up on these particular eggplants. I seriously bought so much and the sad thing is – most of this won’t last but two or three days! I go through so much produce these days and I’m in a hording mode because I know winter is coming and bright, wonderful produce won’t be too common once the cold hits. I need to eat as much as I can now! Also, to my great surprise, I found that they sold the cooking pumpkins in giant wedges! I was ecstatic because I so badly wanted to cook a savory pumpkin dish and the pumpkins they had were just too large! I found the wedges in the refrigerated section and nearly yelped for joy. It’s the simple things in life. 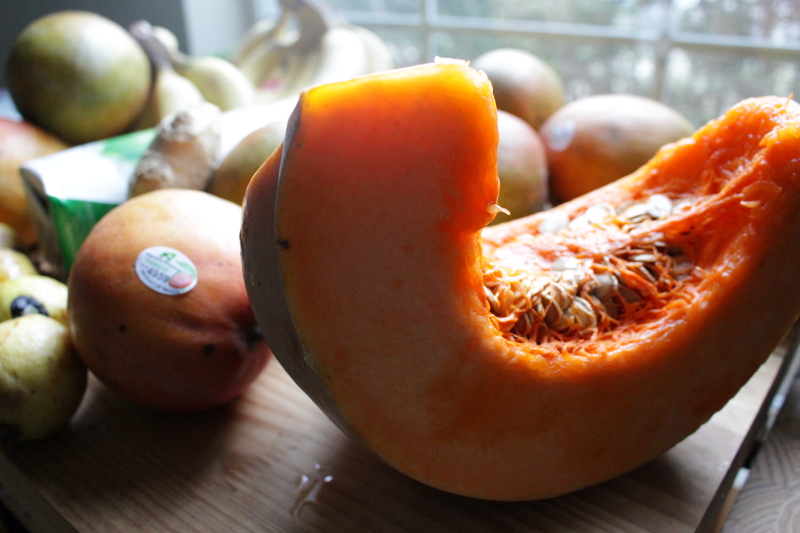 Cooking pumpkins, hugging your dogs, and someone’s radiant smile. Enjoy your week, loves! You earned a good one. Oh my gosh thank you! How do YOU use curry leaves? I don’t have much experience with them but they smell AMAZING. I was beyond excited to see they cut the pumpkin into wedges! I’m the only one in my house who will eat crazy vegetables like that haha. My boyfriend is a ‘meat and potatoes’ kind of guy so I just was sad at first to see that they had nothing but huge pumpkins! When I saw the wedges, I was so happy hahaha! Thank you! I figured that was the case! Yes, I’ll definitely be posting my creation! Thank you for all of your help!